Mirehouse & Gardens near Keswick in the North English Lake District is a super day out for all the family whatever the weather. 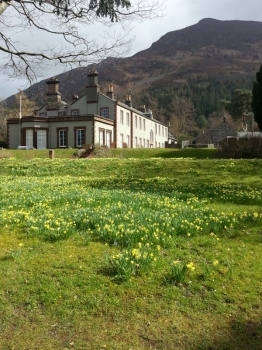 Set in the stunning location between Skiddaw and Bassenthwaite Lake, the gardens at Mirehouse extend through woodland, farmland and sheltered gardens. There are woodland playgrounds to delight the young, plenty of space to burn off spare energy, peaceful walks through the Poetry Walk and the extended walk along Bassenthwaite lakeshore. Spot the Osprey nesting nearby or look out for badgers, deer, woodpeckers and red squirrels. Mirehouse itself with a welcoming family home with unusual literary connections. Relax and listen to piano music or read unique letters and manuscripts in this lovely manor house. Children are welcomed with the family quiz or owl hunt and invited to play in the Victorian nursery. Well worth a trip.